Vaibhav enjoyed our second workshop and learned a fair bit. Here is what he learned. Last time, we entered the rating for students on the card for "alpha". 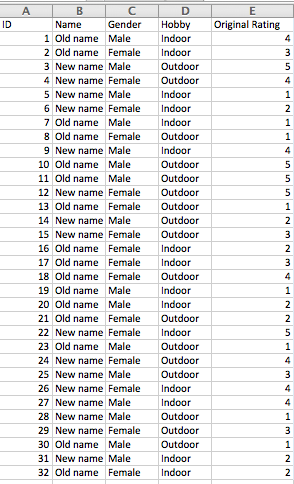 We plotted the data against the features and found that alpha likes to make friends with people having new names. So we say that alpha is more likely to make friends with people having new names. We will predict that those having new names are likely to be friends with alpha. 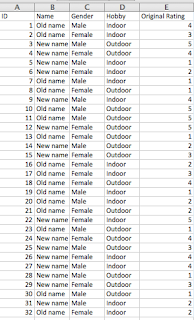 A simple Excel formula will award 5 points if a given person has a new name and will award 1 for an old name. Now we must see if our prediction is correct. We give a 1 if our prediction is true i.e. if for a given person alpha has given a score of 4 or 5 and we too have given him a score of 5, we put 1. Otherwise, put a zero. 1's are correct predictions; 0's are incorrect predictions. To see how accurate we were we will calculate the percentage of 1's or correct predictions. We found that it is 62.5% correct! Not bad!